Though the Radeon HD 7750 is meant to be an upgrade that anyone can afford, and to be a GPU that works in any PC, the faster 7770 model reviewed here has some restrictions. While it runs modern games 25 percent to 30 percent faster, it also requires enough room in your system for a double-wide card and a six-pin PCIe power plug, which not all computers have. It’s fast enough for modern games, but just barely. Nobody likes spending more than they have to, but serious PC gamers will probably want to pony up more than the $139 asking price for the Radeon HD 7770. There’s a vast difference in performance between graphics cards priced around the $200 level and this one. The 7770 is even a fair bit slower than its closest competitor in price, the GeForce GTX 560. 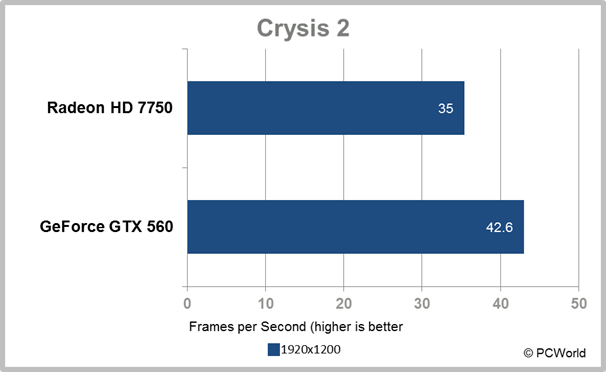 We can look at an individual game, like Crysis 2, and see that the Nvidia card is a good 20 percent faster. In fact, when we average together the results from all our test games (Crysis 2, Dirt 3, Metro 2033, and Just Cause 2), we find the GeForce 560 to be over 25 percent faster. That’s a substantial difference in performance that any serious gamer would certainly take notice of. So why would a gamer with $140 to spend choose the Radeon HD 7770 over the GeForce 560? Simply put, the AMD card is more energy-efficient. While both cards require auxiliary power, the 7750 needs only a single six-pin power plug, while the GTX 560 requires two. Both cards are similar at idle, but when you fire up a game, the difference is remarkable. Like the Radeon HD 7750, the 7770 is based on the low-end version of the Graphics Core Next series of GPUs from AMD. You get all the same DirectX 11 features you’ll find in the impressive Radeon HD 7970, at a much lower cost--and, correspondingly, a much lower performance. The 7770 finds itself in a bit of a tough position, though. While the 7750 could be excused for its middling performance because it requires no power plug and fits into a single slot, the 7770 requires a double-wide slot, as most of the more powerful graphics cards do. 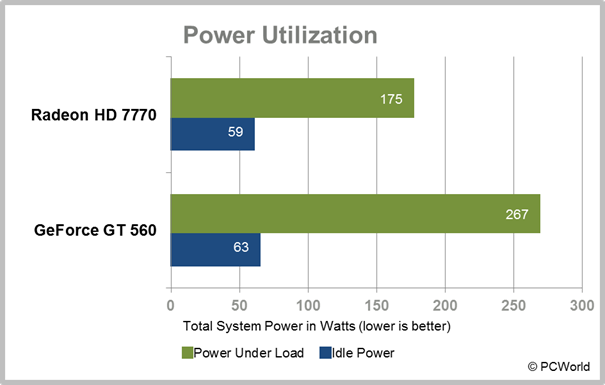 The GeForce 560 it competes with on price requires two power plugs, while the 7770 only needs one. But either way, the card is beyond the reach of all those who have PCs with no extra power plugs for graphics cards at all. The overall performance of the Radeon HD 7770 is satisfactory for the price. You get right around 30 frames per second at 1080p resolution in modern games, with the detail settings cranked up high. A couple of judicious choices about where to reduce quality should provide a nice experience with almost any new game. Still, it doesn’t fit into nearly every system like the 7750 does, and it’s not as fast as many other similarly priced cards. If you’re a gamer, spend just a little more and you’ll be a lot happier. If you’re not, spend less and be just as happy with a card that’s compatible with a wider range of PCs. For gamers on a really tight budget, this is not a bad deal. But to get the most out of modern games, you'll need a more powerful card.